Of course, these two sentences from Luke’s Gospel are the beginning of the “Hail Mary”, the tribute to the Blessed Virgin that every Catholic learns early in life and continues to pray as long as they live. We discussed earlier, in our post on saints, that we don’t worship Mary. We venerate her. How else should we treat Jesus’ mother? Without her, there would have been no Messiah. Obviously Mary could have said no. In fact one reason we do venerate her is because she said yes. “Behold, I am the handmaid of the Lord. May it be done to me according to your word.” Mary could have refused. She could have told Gabriel to leave her alone. She was young. She was engaged to be married. The last thing she needed was a surprise pregnancy. Nazareth was a small town. What were the neighbors going to think? What was Joseph going to say? But she had faith in God and she agreed to do His will. Don’t forget, Mary was born without sin. God had been preparing for this event for years. 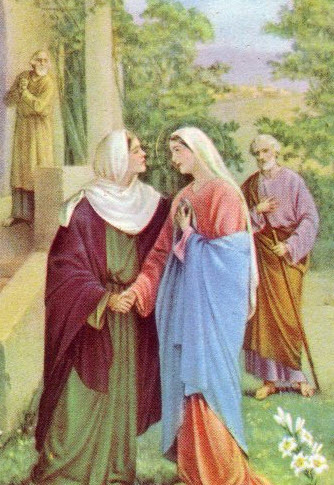 If Mary had refused to go along, He couldn’t just go get another woman. He would have had to start over. But, of course, He knew that she would never refuse to do His will. But why do we Catholics have such a strong devotion to Mary? After all, other faith traditions believe the same Nativity story that we do. They understand that Mary was Jesus’ mother, but they don’t seem to hold her in the high esteem that we do. We pray for Mary to intercede for us with Jesus. Every Catholic church has at least one statue of her. Until recently, Mary was the most popular girl’s name in the United States. There are thousands of Catholic Churches named after her, either as Saint Mary, or as one of her other appellations. We Catholics love Mary. Mary carried our Lord in her womb for nine months. She raised Him from a baby and held Him in her arms after He was crucified. She was assumed into heaven so her sinless body wouldn’t have to lie in the ground. She was Jesus’ mother and I think we can all agree, if you love someone as much as we love Jesus, you have to love their mom. Mary said “yes” to God and gave birth to His Son. As He hung on the cross, Jesus gave her to his beloved Apostle John, and so gave her to us. Mary was very cool. Here’s a trivia question for you. What is the only US city named after the blessed mother? People in Biblical times looked at things a lot differently than we do today. Our reading from Luke’s Gospel is a good example. Remember, Elizabeth was no kid. That was part of the miracle. The angel told Mary, “behold, Elizabeth, your relative, has also conceived a son in her old age.” Looking around this church this morning I’d say we’re a pretty mature crowd. If one of us, or our wife, was to come up pregnant would we think the Lord had shown us “great mercy”? We might think exactly the opposite. Would our neighbors and relatives come to rejoice with us? Luke tells us that the people asked “What, then, will this child be?” They had no idea what he would become. In the continuation of this passage, after he gets his voice back, Zechariah will tell John what he is to become, but no one knows it yet. I guess you’d say these people’s glass was always half full where, today, we tend to see it more as half empty. When God called on them, they usually said yes, even when they didn’t know what they were saying “yes” to. It’s the same thing with John’s name. The angel had told Zechariah what to call the child. “Call him John.” The relatives and neighbors objected. Babies were given family names. It was unheard of to give a child, especially a son, a different name. But Elizabeth insisted that he be called John and Zechariah confirmed it, writing on a tablet “John is his name.” It’s a good thing he did because that’s when he got his voice back. Family names aren’t so important today. In fact a lot of parents seem to go out of their way to hang strange monikers on their poor, innocent children. But how many couples would give their kid a name because an angel told them to? Probably not many. Here’s the thing. People in Jesus’ time were open to the will of the Father. They put God first and themselves second. That’s not so common today. Separated from them by 2,000 years and half a world away, I think it’s hard for us sometimes to understand just how obedient those people were and how much we come up short. Some might say that God has never asked them to do anything. They would be wrong. God speaks to us in any number of ways including through the Scriptures and through signs. The problem is that most of us don’t take the time to listen. We need to be open to the Father’s word and to listen for it. In today’s Gospel we read of the birth of John the Baptist. Isn’t it odd that when Elizabeth’s neighbors and relatives gathered on the eighth day for the baby’s circumcision that they had already chosen a name for him? My wife and I have four kids and we didn’t let our neighbors and relatives pick a single name. I doubt if you did either. This elderly woman has had a baby, her husband has had his voice taken away, and the relatives and neighbors are amazed that they’ve chosen to name the baby John? That seems to me to be the most normal thing that’s happened around there for a while. But don’t we all know someone like that? They overlook the main thing to focus on the small stuff. You know, the ones who rearrange the deck chairs on the Titanic. Well, we know the answer to the question. John will go before the Lord to prepare His way. Everyone of us is a little bit John. Our calling is to prepare the Lord’s way, too. Tomorrow is Christmas Eve. As we wind up the Advent season, hopefully we can look back and see that we’re just a little bit more ready than we were four weeks ago. If so, then our Advent has been a success. In today’s Office of Readings Saint Ambrose reflects on Mary’s visit to Elizabeth. Quoting Luke’s Gospel he writes, “as soon as Elizabeth heard Mary’s greeting the child leapt in her womb, and she was filled with the Holy Spirit. Ambrose explains that John received the Holy Spirit from Jesus’ presence and Elizabeth received the same Spirit from John. Elizabeth received the Spirit after John was conceived where Mary received the Spirit before Jesus was conceived. As Elizabeth says to Mary: Blessed are you because you have believed. We all have the opportunity to share the Spirit with others when we proclaim our belief in the Incarnation, in our actions and our words. And isn’t that the greatest Christmas gift of all?